90 years young. It is with much regret and sorrow that the family of Fluff MacKenzie has said their last goodbyes to a great wife, mother, grandmother, Aunt, Sister, Cousin and friend. She leaves behind Husband Karl of 71 years, daughters Patti Smart Economy NS., Becki Henderson (Peter) Fairview AB., and Katherine MacKenzie BC. Grandchildren Colleen Connolly Economy NS, Joseph Connolly (Christine) West New Annan NS., Carli Dunbar Reid (Phillip) Edmonton AB., Richard Dunbar (Charlena) Pictou Co. NS., and MacKenzie Smith California. Step grandchildren Bonnie Smart Borden Vancouver BC., Kim Smart Fredericton NB., Colin Smart London UK. Great grandchild Carli Dunbar Pictou Co. Nieces and nephews Harold, David, Debbie, Margaret, Sharon, Michael, Tony, Bobby, Stanley, Dale, Wayne, Derek and Karen Weatherbee. Cousins Rose Brown, Jeanne and Kent Archibald. She also leaves behind best friends Ted and Theresa Slaney Montreal and her RCR family. Predeceased by her Parents Muir and Florence (Totten) Weatherbee. Siblings Joan Bagnell, Harold, Vernon and Alvin Weatherbee. Cousins Maizie Archibald and Rose Tedford. She was the rock of our family and set us on a good foundation, always there with a listening ear, care packages, lessons to be learned and opinions. With our many military postings, she treated them as adventures and was both mom and dad when Dad was away (Korea, Cyprus, many courses and military manoeuvres). She always said if anything was going to go awry it would happen when the men were away, but she always coped like the soldier she was, without complaint. 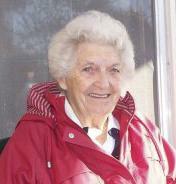 She loved to garden, was a fantastic seamstress and quilter. When Dad retired from the military and moved back to Truro, she found a place for her opinions with the Conservative Ladies Association. She also enjoyed her yearly job selling tickets at the Exhibition and meeting all the people. In my mothers home nobody got through the door coming and going without a big hug from her. Her grandchildren loved their Nanas hugs. A highlight for her in her later years was travelling to Korea at the invitation of the Korean Government and visiting the grave of her brother Vernon. She was also presented the Korean Medal by the Korean Ambassador on the 50th Anniversary of the Korean War. She will be sorely missed by all who knew her.